They are a bit aged but shiny and I like shiny. I can already picture trailing foliage. 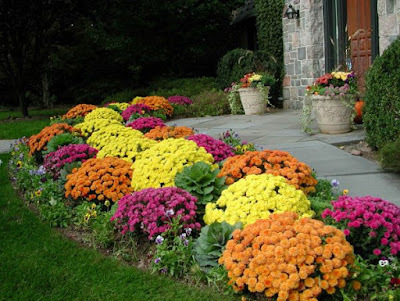 I also picked up a bunch of the $1 mums from Depot (although Lowes has them for the same price). Mums are great filler and so cheap! The smallest hostas were 3/$2.49 so I hope once the soil dries I can get them all in the ground. Sadly, less than ten days after I found out the town has a compost heap, I was talking about it with my neighbor and it appears to be a finite source. I assumed it was created year round but from what she said it may only appear in the fall. This means I need to get there as soon as the rain lets up and scoop up as much as I can for my front lawn garden!